A couple of days ago there was a new maintenance. With it came two main changes: a new epic LM song (personal point of view, kinda feel like I'm in a movie) composed by Klaus Badelt and performed by the London Symphony Orchestra and a new research, as well as some little improvements within the game. If you go to your research tab, in "Upgrade military" there's a brand new research available to all of us. If some might think it will take years to unlock it, the "Rally priority" research takes 5hrs ish depends on your gear's level. With it you have two new sets [Hightest Tier] and [As recommended]. But what does it bring to our gameplay and how does it work? When I first unlocked, I was pretty disappointed. Mainly because I was expecting some new feature when rallying a darknest or a castle, but instead I got the same old presentation, nothing seemed new on my screen. Picked the closest Darknest. No changes. Same goes for this image. – Only noticed a difference when joining a friend's rally. This is what you see. Same function as "gathering priority". Three option available to you. 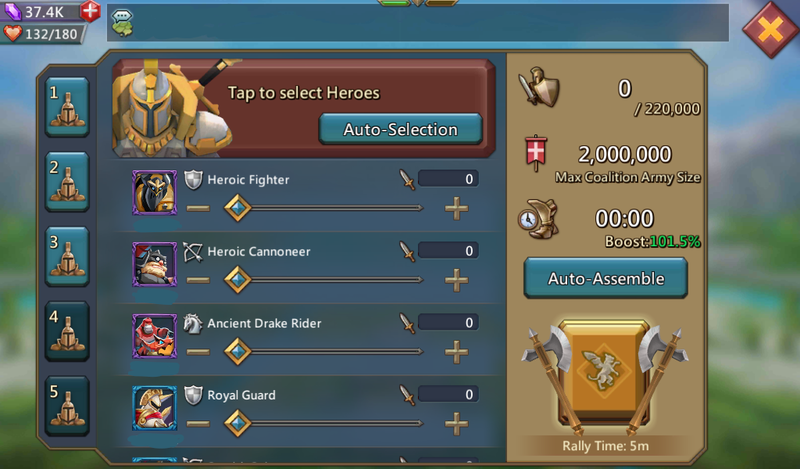 [Auto-Assemble] selects automatically the troops available within reach in your barrack. 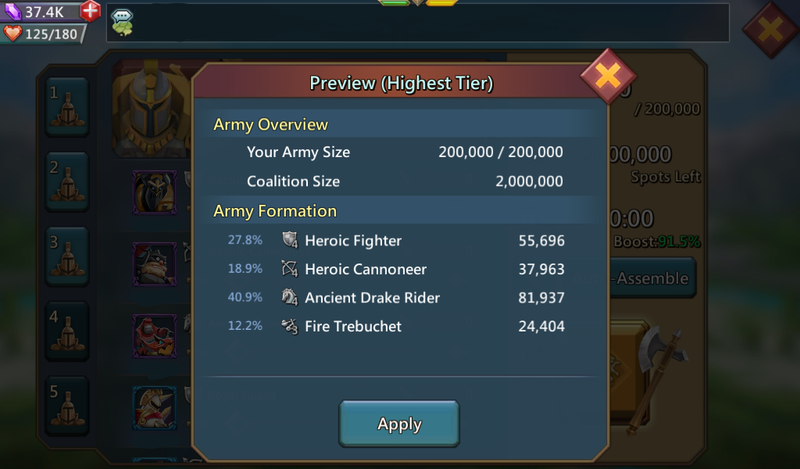 [Highest tier] selects the highest troops available to you (so if you have t4s, for example, it will choose them over any other troops). [As recommended] is based on what the rally leader is sending. If he/she is sending full 250k t4s, this feature will automatically select 200k t4 of the same type troop as the leader. If you do not have 200k t4s, a red dot will appear saying that you need X amount of troops to send a full march. The rest should be done manually. My friend had 250k t3 mixed troops in this "fake rally". By selecting [Highest tier] it automatically selects my highest troops (as the name clearly suggest it lol), since in my case are t4 troops. I don't have the t4 siege, so it selects the second highest troop available to it, ie my t3 siege troops. The percentages are exactly based on what the rally leader sent. Same "fake rally", [As recommended] tab. Selects the exact same troops sent by the rally leader. In both cases, select "Apply" and troops will be set. 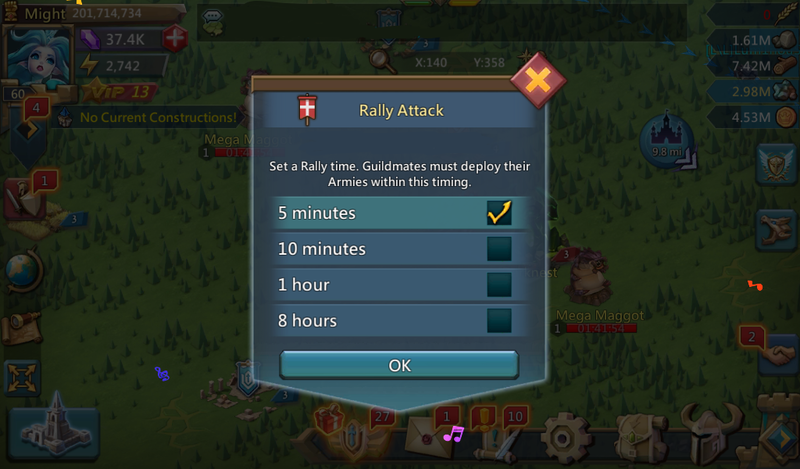 You can do the last checkup before you actually send your troops to the rally you're joining. Observations: I think it's an incredible feature, it'll make rallies easier mainly because we won't be struggling with the percentages and the troops required for the rally. It won't be possible to send cavalry in an infantry/ranged for example (unless you don't have this research, and in that case cheeky you lol). However… because there is one, I have some concerns. 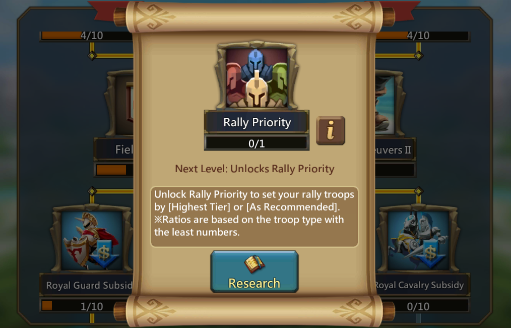 We've all joined rallies at least once when playing the game, but sometimes rally leaders send "meat shields" either siege troops or other (t3, t2, t1s usually 2 or 3 troops) in order to avoid the wall traps of the enemy… meaning that for those using this feature will automatically "copy" what the rally leader is sending and you end up sending a variety of troops that you must NOT send in the rally.